The appearance of my summer garden was largely saved by Salvias this year. I’m not overstating things when I say that the days were torrid and the garden parched during five weeks without rain, but the Salvias kept on flowering, even after their January trim. I lost quite a few plants: a beautiful Ceonothus ‘Blue Pacific’ (now replaced with a Banksia ericifolia ‘Little Eric’), a Potentilla which struggled from the time of planting, several Ericas, a Pittosporum (which may have been a victim of overwatering, I have to confess), my Geranium ‘Rozanne’ despite being under a shade cloth, and a climbing rose which found life by the metal fence just too hot to bear. Other plants looked positively exhausted and very much as though they mightn’t survive, drooping as though they had the cares of the world upon them, which they probably did, botanically speaking. The early Autumn flush of rose blooms baked on their stems as though they’d been in an oven. My Six this week is devoted therefore, to Salvias, those stalwarts of the garden. Number one, above, is Salvia microphylla ‘Ribambelle’ seen here cavorting with Verbena bonariensis, another plant which seems to take everything the weather throws at it. I have discovered since planting the Verbena in the garden, that it’s a weed in these parts, appearing along roadsides in large numbers. No matter, I’m happy to have it in my garden complementing ‘Ribambelle’ and filling spaces with its airy personality. Two: Salvia greggii (I think). Dainty flowers dancing on a prolifically flowering shrub that grows to about 60cm tall, perfect in the middle part of the garden. Three: Salvia ‘Indigo Spires’ a super tough, indispensable addition to the garden: inclined to sprawl a bit, it benefits from a good trim in midsummer. Four: I haven’t been able to identify this one, so I hope someone from the SoS crew will be able to help out. Five: Salvia ‘Indigo Blue’, not to be confused with ‘Indigo Spires’ being a much better behaved plant that keeps tidy and flowers all summer. 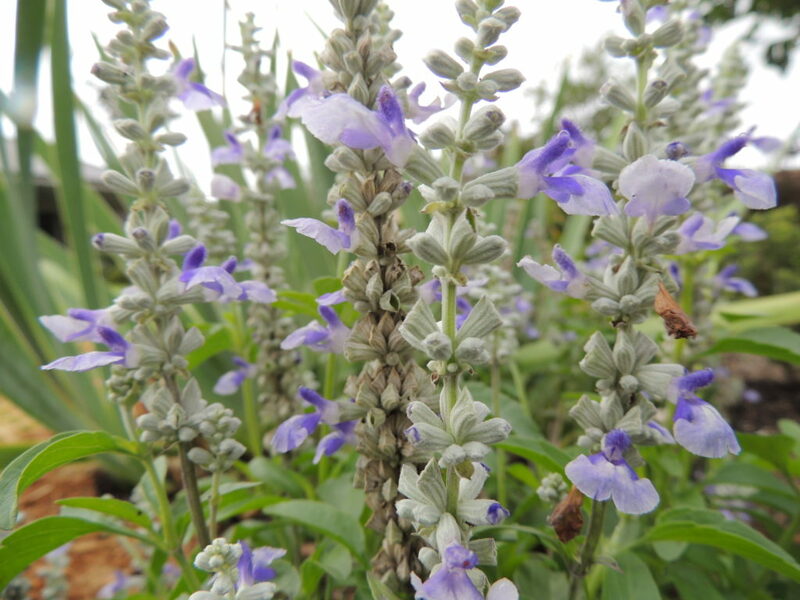 Six: Salvia farinacea blue (obviously), coming to the end of its flowering season now. 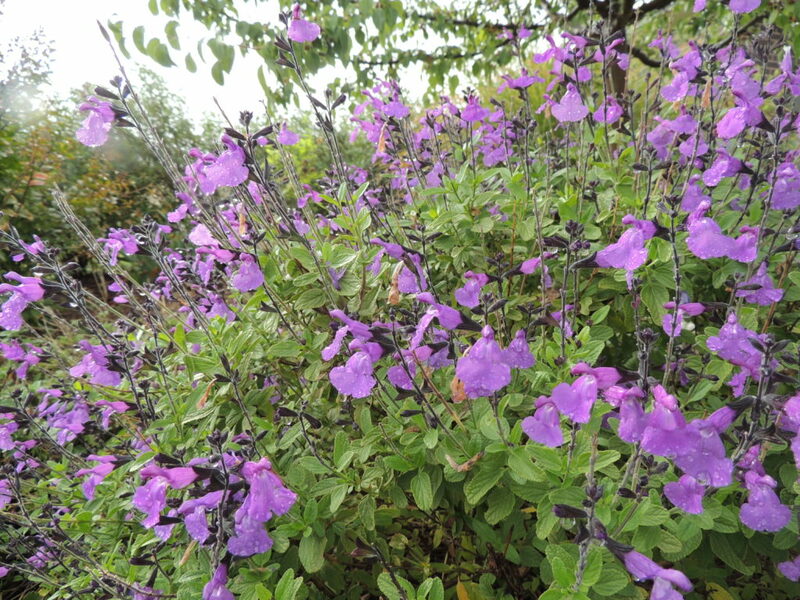 There are other available Salvias -hundreds in fact- and most of them seem to have the qualities of hardiness required when gardening in a harsh climate. I also have Salvia nemerosa in various shades, but they have stopped flowering now. I’m pleased to add that in the last couple of weeks we have had plentiful rain, inches in fact; evidence of which can be seen in this week’s photos. Lawns that were crackly and crisp greened up in a matter of days -proof that it isn’t imperative to water kikuyu grass, and most plants are going all out for a bit more growth before the weather becomes wintry. Six on Saturday is inhabited by a great group of gardeners from many different countries led by the Propagator. If you are interested in what they have in their gardens, you can pop over to his blog by following this link. 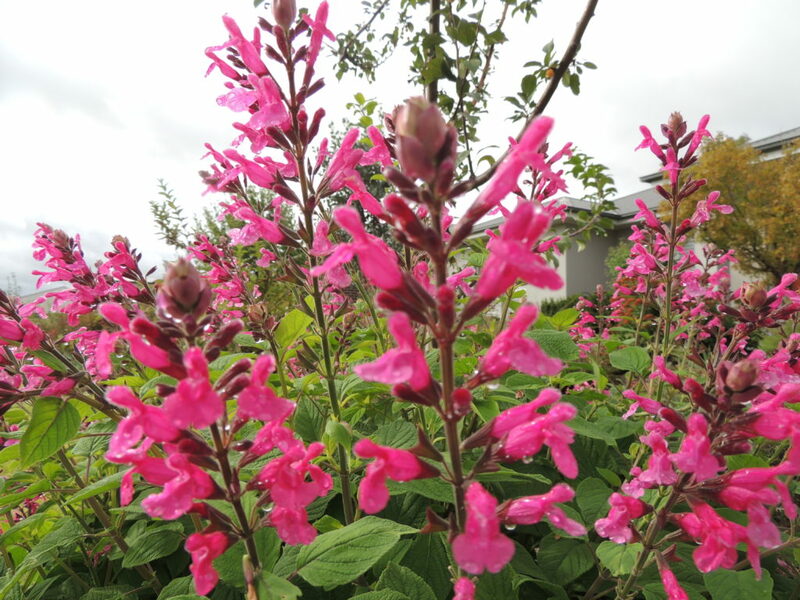 Sorry to hear of your losses, but so pleased that you have featured salvias as I am a sucker for a salvia! I especially love Indigo Spires. Glad to hear you have had some rain and a little relief from the relentless sun. Now some shopping to fill the gaps? Definitely, Gill. I’ll be looking forward to it immensely, but trying to sensible with my choices. So sad about the summer’s losses. Such a bad year in Australia’s east coast gardens. The salvias are wonderful and I shall take them on board! We’ve had the hottest summer too, and haven’t had rain here since before Christmas. A few little showers that didn’t even wet the earth. Wondering how long we’ll have to wait. Oh I hope you receive decent rain soon, Prue. We’ve been exceptionally lucky recently. There are quite a lot of white salvias- I know you like white flowers! By the way, I love the new theme for your website. Thanks Tracy re the theme. Glad you received some rain too. I was rather despondent for some weeks and found myself wondering what I’m doing with such a big garden. But the rain has dispersed those thoughts now…until next time! Oh I agree Jane, salvias are the queens of the late summer garden whatever the climate and they are so easy to propagate. (Oh, of course, that is early spring with you, how weird.) I love Ribambelle, I haven’t seen it before. Sorry to hear about your losses, I hope you have fun filling the gaps. I will have fun Chloris. It’s the panacea for the loss of plants. And I’m going to be more sensible about my choices (I think) and replace some of the dead plants with natives. 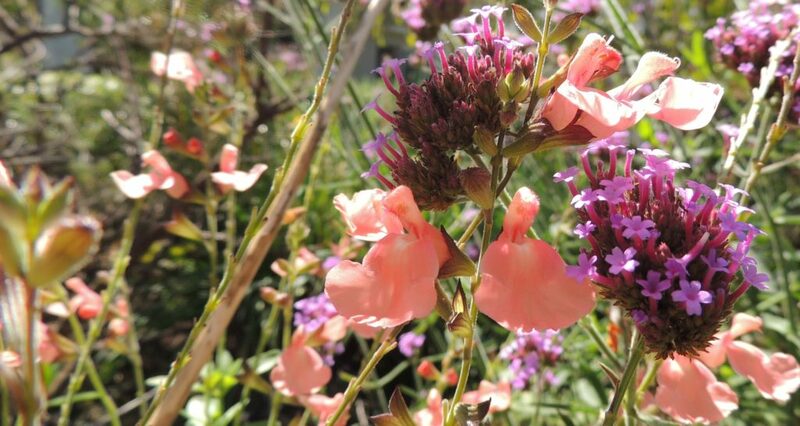 The salvias have beautiful flowers and butterflies love them, like hummingbirds if you have … Beautiful collection! Thank you Fred. There’s an endless supply of salvias to choose from! Sounds like you’re sharing our rain down in Melbourne, Jane. Sorry to hear you lost so many floral friends this past summer – it was not an easy one for any Aussie I suspect. It certainly wasn’t, Vicki. I’ll enjoy planning and buying replacements though. I wouldn’t compare our weather to yours but we are needing rain! There was quite a bit while we were away visiting our daughter in Dubai but none since we came back nearly a fortnight ago. Lovely selection of salvias anyway. One thing I think you can be sure of Granny, is that you’ll have more rain! Perhaps some salvias for you too? Lovely to see you back here Jane. Such a lovely collection of Salvias. I have a few in my garden which were very tiny last year and I hope will take off and flower this summer. I think buying native plants is a good idea as they tend to be survivors. Maybe have a look at Beth Chatto’s gravel garden for some inspiration for drought tolerant plants. I realise you might not get all of them over in Australia, but might give you some ideas. BTW still have to login in with name and email. Thanks, Jude, and thanks for the link to Beth Chatto. I’m familiar with her work, but it’s always good to revisit. Our temps last summer were enough to try the existence of most plants I think, except maybe cacti, (even some of my succulents got burnt) and it’s too cold for many of them in the winter! I have (again) checked the box that means no personal info has to be given to leave a comment, so I hope it works this time. I’m sorry you had such a hot dry summer. We often have similar conditions here in the summer, although I don’t think we’ve ever gone 5 weeks without rain. That kind of summer takes some of the joy out of gardening as you watch you precious flowers suffer and struggle to survive. Your salvias look beautiful despite the conditions, and I wish I could send some rain your way to give you all a reprieve. Hi Cindy, We have been very lucky with rain in the last couple of weeks, but it certainly went awol during the hottest summer on record, and the weather really affected my enjoyment of gardening. It was just too hot to go out anyway. I’m back out there now though, as the weather has cooled down a lot and behaving in a much more autumnal fashion. I love salvias too. I lost my Radio Red autumn salvia over the winter. I’m sorry you lost your Salvia, Lisa. I wonder how cold your winter is? It gets pretty cold here: no snow, but heavy frost. I cut mine down to the ground in winter, and a covering of mulch would also help. Salvias are the stars of any dry/hot garden. I’ve had them in California and the south of France (two places) and they just keep on going. Lots of color choices as well. I do love them. Don’t feel too bad about the Ceanothus, they can be quite tricky. Native to my former state in the US (CA), some of them drop dead if you walk by with a glass of water in the summer. I’ve had glorious ones suddenly just go. Its spring here, warmed up very early, and its been very dry also. Time to plant some salvias. Interesting you should say that about the Ceonothus, Bonnie, as I may very well have over watered it. It perhaps received too much when MrMG watered the lawn. My new resolution is to replace plants with natives which should be more resilient- and of course, more salvias! Salvias are a great group of plants for the water-challenged garden. Yours are so pretty! Thank you, Eliza. I’d like to add some more. I’m sure I can find some empty spots…..
It’s been the same here in south east QLD, so dry for so long – ever since November. My poor roses were in survival mode and, like yours, the only plants in flower were the salvias. They must be so hardy. In the last two weeks we’ve seen the remnants of Cyclone Trevor pass through and have received more than 200 mm – so welcome. Suddenly the grass is green and all the roses are covered in new growth. They must have sighed in relief. I’m glad to hear Cyclone Trevor brought you some rain. It’s amazing how quickly the garden bounces back afterwards. Hopefully there’ll be some follow up. I’m glad to hear that your weather has markedly improved since your miserable summer, Jane. You’ve got a great collection of Salvias. My own experience with Salvias is somewhat mixed. The California native S. clevelandii do well here, as so the varieties originating from South Africa, but those with South American roots (no pun intended) are generally short-lived. I have a Salvia ‘Celestial Blue’, a hybrid of clevelandii and something else in my garden Kris, but didn’t include it because it isn’t flowering just now. It’s a glorious shade of blue, very appropriately named. I also have ‘Amistad’ which I read originated in South America, but I didn’t include it this week because I posted about it recently. I’m surprised they don’t do so well for you as I would have thought your climate perfect for them. I learnt something new thanks to your comment, as I hadn’t thought to wonder where these excellent plants originated. I never knew Salvias come in so many colours, thanks for these great photos. I’ll have to start looking for them – we often go weeks with no rain in the hot summer. I’m no expert, Chris. I think there are some that could do well just about anywhere. They should be cut back for winter with a good covering of mulch to get them through. The fact that you have serious snow and cold would be the deciding factors in their survival and I think they would have to have a strong root system to survive. Alternatively, take cuttings and keep them in your glasshouse to plant out again when the warm weather comes. Always good to have an insurance policy. Beautiful pictures. I don’t have any salvias but reading this makes me think they’d do well in the front garden where most plants struggle in the heat during the summer. Hmm… The Salvia farinacea blue is very nice indeed. I think they would be fine there. You’d probably have to be prepared to water them every now and then as they can’t go completely without water. The farniacea seems to be one of the toughest. Thank you Lis, the arrival of the rain certainly lifted everyone’s spirits and gave an instant boost to gardens in this area. It’s amazing how quickly things improve when the weather is still warm. It can be a difficult climate for gardening here, but some people in other parts of Australia would probably wonder what on earth I’m complaining about:those who garden further west, in Broken Hill, for example. Careful choice of plants (a maxim I haven’t always followed!) seems to be the key, I think. I am glad to be living in a (normally) temperate climate. Your summer sounds brutal. It was dry here last summer and quite hot for us but yours sounds next level. I have a few salvia too so am hoping for a good display this summer. Glad you have had some rain and are enjoying the garden again. I hope you post some Salvia photos when the time comes Mr P as it would be interesting to compare notes. Yes, our summer was brutal, but I’m coming to understand that we don’t have a monopoly on difficult conditions here, and so many gardeners have wonderful gardens in the face of adversity. Comments about changing weather patterns are very interesting—from Mudgee, Australia to Highland Lake, Alabama, US. It’s interesting, isn’t it. We gardeners all seem to have some difficult conditions to deal with no matter where we are. Regular rain is something we all wish for. In the meantime it seems that Salvias may be the answer! Yes, it’s certainly worth having some in your garden no matter what the climate is like. Such variety of salivias – thanks for sharing. I had none at all but have just bought five little plugs so my salvia salvation starts now! I’m sure your Salvia plugs will thrive, and they’re amazingly simple to grow from cuttings as well. I’ll look forward to seeing yours on a Six some time in the future! So sorry about all your plant losses! Summer can be so brutal to a garden too, and losing a good Ceonothus must be hard to swallow. Will look forward to seeing your new Banksia! Hi Amy, I have had no success at all with S.officinalis, with each one I’ve planted going well for a while and then suddenly dying for no apparent reason! But I agree that they are excellent additions to the garden. I’ve found that Salvias grow remarkably easily from cuttings so it’s easy to build up a collection. I’m hoping that my new Banksia will have had enough time in the ground to set some flowers soon: it’s quite small, so I may have to wait. Salvias are king in our garden. They never fail and flower for ages. No matter how they are cut back, each summer they rear their heads and grow up to 8feet tall. We love them. Some species are banned in some states of the US for their ability to get high on when dried and smoked. I’m glad you belong to the Salvia admiration society, Gerard. 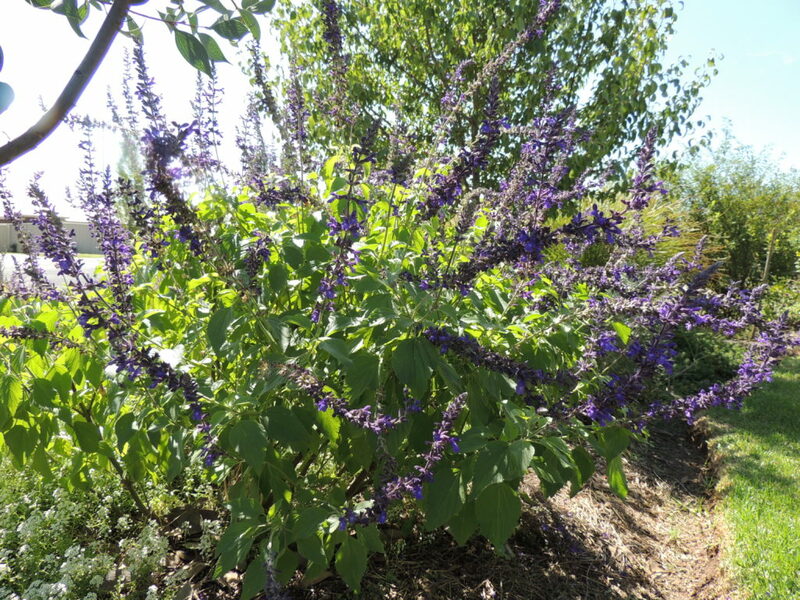 I have heard about the Salvia that produces a high…it can probably be found here too. Lovely Salvias! We grow Salvia hotlips and they have just gone back out into the garden after spending the winter in the conservatory. It is too cold here for them to survive outside all year. It’s lucky salvias grow so easily from cuttings, so it’s possible to have a constant supply even if they don’t make it through a season. Your salvias are gorgeous! I have several and I agree they are the saviours of my Mudgee garden too. Gorgeous colour combination in the featured photo with the verbena. Thank you, Jane. It’s a blessing to have a saviour or two during hot weather.